At Buy Sheds Direct we strive to support as many charities and good causes as possible. Our work over the years has ranged from office based fund raising to national web campaigns. We are constantly looking for new ways to help raise awareness and draw attention to good work being done on a local, national and international scale. Again, we are supporting the men - Movember 2014. We have set up the same system as last year, whereby we donate £2.50 from every order over £250.00 as this was a great success! Cake sale went extremely well again this year, we managed to raise a total of £171.00 by internal staff sales and external by visiting the businesses we work around. WELL DONE TEAM. As a team we supported Movember by donating £2.50 from every order we received over the total of £250.00. We had 3 gentlemen from our Customer Service Team involved in growing their mustaches for personal fund raising. All in all, we raised £845.00 for Movember 2013. We supported Children in Need in 2013 and raised a total of £120.10!!! 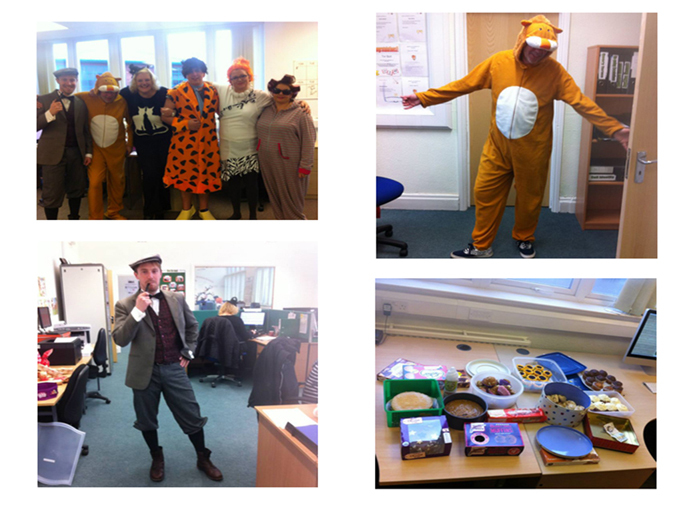 We had cake sale contributions from the team and a "dress down" / "dress up" day.